Join us as we honor 50 years of passion and dedication by a very special Head Start Teacher, Donna Coleman. Donna retired on July 27, 2018 after 50 years as a Head Start Teacher. Donna has taught, nurtured, and inspired generations of Charlestown children and families. 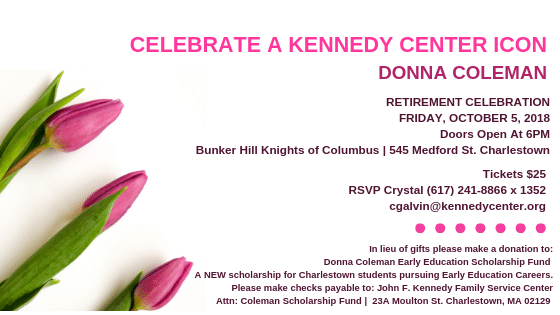 Celebrate the incredible career of a remarkable woman on Friday, October 5, 2018 at the Bunker Hill Knights of Columbus in Charlestown. Tickets are $25 and will include dinner, dancing, and a tribute to Donna. If you have memories or special photos you would like to share during the event, please give us a call. We want to hear from you! The Kennedy Center is also proud to announce the creation of the Donna Coleman Early Education Scholarship. This NEW scholarship was created to honor Donna‘s legacy of service and dedication to Charlestown children and the Early Education field. The Donna Coleman Early Education Scholarship aims to assist Charlestown students pursuing Early Education Careers. The application process will be announced in 2019. In lieu of gifts, we ask that you consider making a donation to the scholarship in Donna‘s name today.